2.Adopting A Racing Greyhound- by Cynthia A. Branigan. - **The Other End of the Leash- by Patricia B. McConnell PhD. The Reign Of The Greyhound- by Cynthia A. Branigan. Child-Proofing Your Dog- by Brian Kilcommons. *Recommended for Families with children under 12 years of age but we always endourse postivie trainng methods. Avoid any other suggestions. 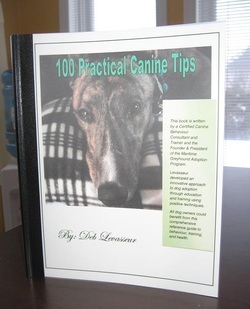 100 Practical Canine Tips second edition - by Deb Levasseur CTB. 140 pages of 100 different practical tips on: caring for your greyhound, training, health, behaviour, and a bit of history. Includes an index and categorized table of contents for quick and easy reference. All new adopters have this book included in their low membership price (as well as their training manual and their handbook).